Ninety-nine percent of the enterprise workforce currently uses mobile devices - smart phones and tablets - to perform their jobs today. And nearly 60 percent of security leaders describe their organizations as either partially or fully mobile, deriving enhanced productivity and other business benefits. But 63 percent also say that mobility comes with a greater number of security risks and concerns than expected. And 59 percent say more IT resources are required to support the increased number of devices and applications. 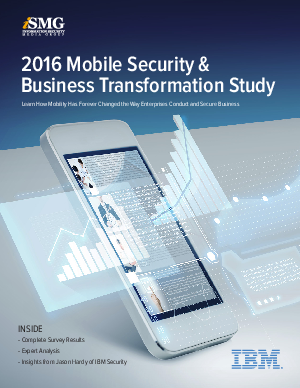 These are among the key findings of the 2016 Mobile Security & Business Transformation Study, which examines how mobility has transformed how enterprises conduct business.